I wasn't planning on blogging this because it was an "on the fly" kind of meal. I don't have a lot of photos, but the chicken turned out so good I had to share the recipe and what few photos I did take. 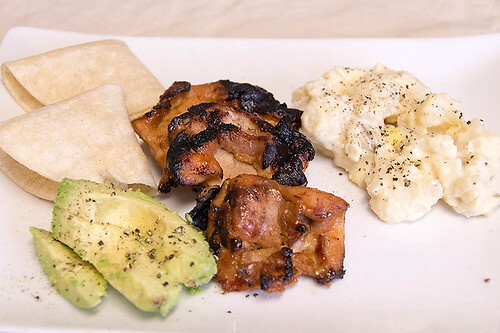 Skewered chicken served with potato salad, avocado slices and corn tortillas. I modified an Indonesian marinade recipe adding some Asian flavors. I had a pound of boneless, skinless chicken thighs that hung out in the marinade for about an hour in the refrigerator. I cranked up the grill, skewered the meat and got grilling. I grilled them over medium-low heat. 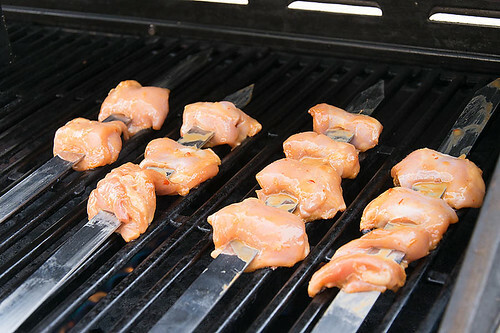 I was careful to turn the skewers frequently and moved them around on the grill. 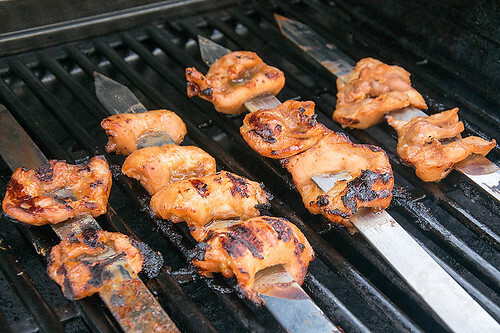 Be prepared for a really messy grill. Here's my recipe, I hope you try it. Enough marinade for 6 chicken breasts cut into cubes.